Exhibiting a dog is an expensive but exciting hobby. 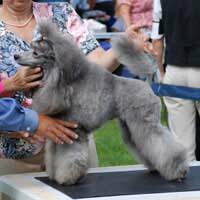 With a little thought and planning it is possible to save money while still enjoying trips to dog shows. Petrol is one of the biggest outlays when travelling to dog shows. Car sharing will not only halve the cost but give you company on the long journeys around the country. If you do not have a friend in your breed that can share with you advertise your idea in the canine press or on one of the many dog forums. Make sure that not only does the person exhibit in the same group as yourself (otherwise they could be there on different days) but that your dogs will get on with each other. Your dog will think of the car as his territory and be wary of unknown dogs sharing it with him. The dogs are best separated in case they fall out or there is an accident. A cage or canine seat belt is best for this. Buying food at the major dog shows is a big expense. By taking your own food and drink you will not only eat more healthily but save a considerable amount of money. Too busy grooming your dogs to prepare food for yourself? Share this task with the person car sharing with you. By alternating who takes the food it will give you both time to prepare your dogs. Entries for your dogs can be very expensive. First check that you really need to enter this dog show and that you are able to attend. Does it clash with a family event or holiday? Are you unsure of the judge? If in doubt save your money and don't enter. Join the organising club as a member, members always get a discount on their entries plus other perk such as yearbooks and discounts to ringcraft and seminars. It goes without saying that a handler needs to look clean and presentable. This does not mean that you need to shell out on expensive clothing every time you exhibit a dog. Charity shops and online auction sites are reliable ways to purchase smart slacks, tops and flat shoes. When you want to change your wardrobe sell on your items of clothing or donate them back to the charity shop. Every show has many trade stands selling top of the range grooming products that compete with each other as being the best for your dog. Remember you do not need grooming products, in fact the Kennel Club do not allow any dog to be exhibited with products in their coats. When bathing your dog you can use your own shampoo and conditioner or supermarket own brands. Old blankets and towels are ideally recycled for use with your pets. Soft toys can be purchased at jumble and boot sales. Wash the item and remove any objects that can be chewed. Your dog will not know that his toys are not from an expensive range in a pet shop. Every championship show and particularly Crufts have major pet food manufacturers giving massive discounts on their products. Further more you will receive discount vouchers enticing you to try their products. Pick only the companies that you would normally buy from and stock up when the offers are available. Many of the major pet food manufacturers have breeder or member clubs. By signing up with these you are able to purchase your dog food at a discount and also receive information and samples as they introduce new stock. Many of these companies also give nutrition and veterinary advice to their members. With a little planning and investigation you will be able to continue enjoying your dog shows without it costing a fortune.